Successfully Added USB 802.11N WiFi Dongle for Desktops + Laptops (150 Mbps) to your Shopping Cart. Presenting the wireless USB adapter that comes with the 802.11N protocol for super fast internet as well as strong signal connectivity, while still maintaining backward compatibility for current 802.11b/g WiFi protocols. Have you ever though it impossible to expand the wireless signal of your WiFi router? Well, this 802.11N wifi dongle works up to 200 meters indoors and 830 meters outdoors, giving you an incredible range in which you can connect to the internet. With this 802.11N WiFi dongle, you can still connect to your WiFi router from over 200 meters in doors, and 830 meters outdoors. Finally, you can surf the net without constantly being disconnected due to poor signal strength. After installing the included user friendly software, you will be able to gain instant internet access to any nearby 802.11 N/G/B wireless networks. The included user friendly utility software will also show you all nearby available wireless networks up to 200 meters away when indoors and 830 meters away when outdoors. This USB WiFi receiver & antenna simply makes it easy for you to install a wifi dongle without having to dismantle your desktop PC or laptop computer, and in the process, it will save you a lot of money. This Wireless USB Adapter also lets you set up data encryption and network authentication, making sure that only authorized individuals can access your network and go online. The powerful 802.11N Wireless USB Adapter is in stock now and available for single piece and bulk orders. Click "Add to Cart" now, and we'll express ship you out a sample straight away! This powerful 802.11N WiFi receiver and antenna is brought to you from the leaders in China factory direct wholesale electronics, Chinavasion. Will this 802.11N wireless internet adapter work when I am in Starbucks, the airport or other public WIFI hot spots? Yes, this will connect to any wireless network at the maximum speed available on the network. Many public WIFI hot spots are currently only 802.11G, in which case your speed will be limited to 54Mbps. Will this work on my Linux or Mac computer? Yes! There are Linux and Mac drivers included with this model that allows it to work perfectly. How does the wireless 802.11N USB adapter work? 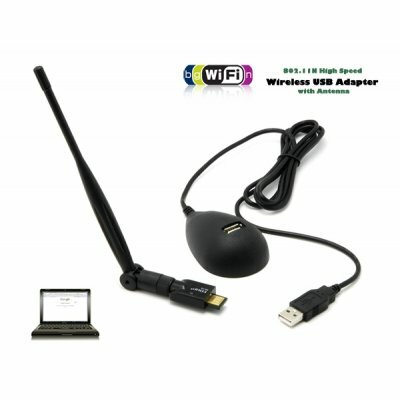 The wireless 802.11N USB adapter is very handy if your laptop or desktop computer does not have a wireless internet card or you want to upgrade your existing connection to the new "N" standard. If you have a wireless internet connection at home or the office, and need a wireless card to connect to the internet, simply plug in and install this wireless 802.11N USB adapter to your PC or laptop and wirelessly connect to the net! Does installing the wireless 802.11N USB adapter mean free internet? Only if you are at a Starbucks or near other free WIFI hot spots. Iam very happy for the wifi.The delivery is very spreed 3days in belgium.Super the performance of the WIFI and thanks to chinavasion.